The most important amenity for a North Myrtle Beach vacation is easy access to the beachfront. Beach Club III is positioned right on the white sandy beaches and has a beautifully landscaped walkway that leads right to the Atlantic Ocean. Take a small beach tote outside with you that contains your favorite book, sunscreen and a beach towel. Spend the day at Beach Club III basking in the sun and getting that golden glow. It is easy to fall asleep with the sound of crashing waves and seagulls in the background. Skip down to the water and go for a quick swim. In the summertime the Atlantic Ocean is nice and warm and floating on your back as the waves bob beneath you is one of life’s simple pleasures. You may also go swimming in the inviting swimming pool at this North Myrtle Beach resort. Located on the ground floor, this covered swimming pool offers respite from the hot summer sun. When you need to get into the shade but you still want to have a good time, go for a dip in the Beach Club III swimming pool. This blue pool is on the oceanfront and at the edge of a beautifully manicured and nicely landscaped oceanfront lawn. It is a most welcoming scene, one that is also enjoyed from the oceanfront balcony of your North Myrtle Beach vacation rental at Beach Club III. Inside your comfortable accommodations at this North Myrtle Beach resort you will find plenty of space in which your family or friends can spread out. There are three- and four-bedroom North Myrtle Beach condominiums at this North Myrtle Beach resort. 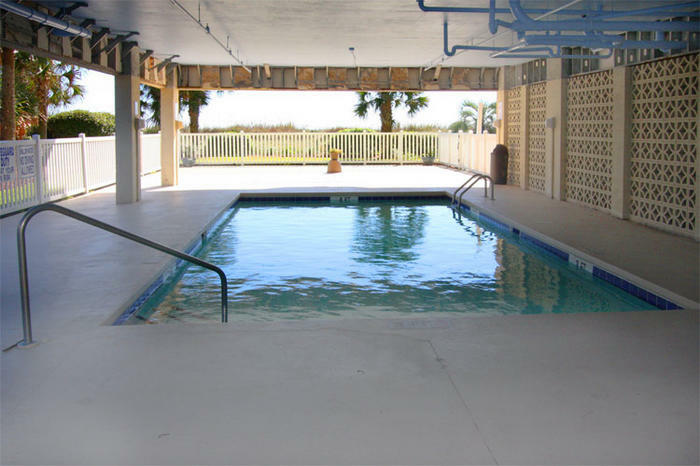 All of these condos in North Myrtle Beach have three baths for your convenience. There are sleeping arrangements for either eight or 10 people so these North Myrtle Beach rentals are furnished so that a golf foursome will be most comfortable, even a golf foursome that brings their spouses along on this North Myrtle Beach golf getaway. The most striking feature of these North Myrtle Beach rentals is the oceanfront balcony. What a peaceful place to relax and put your feet up while watching the Atlantic Ocean. These balconies are furnished for your comfort and are an ideal locale within your North Myrtle Beach condominium rentals for taking it easy. The living room and the master suite have a sliding glass door to the oceanfront balcony and a full-length window so the light just shines through. The kitchen in each of these condos in North Myrtle Beach is nicely equipped. With full-size appliances, cookware, dishes and utensils, these kitchens are primed for you to move right in and enjoy a North Myrtle Beach vacation. A dishwasher is included in your kitchen and the breakfast bar is a convenient area at which you can serve breakfast to the kids. The master suite in these North Myrtle Beach vacation rentals features a Jacuzzi tub, yet another way to relax during your North Myrtle Beach vacation. Get ready for a night of dinner and dancing during your North Myrtle Beach vacation by first taking a leisurely soak in the Jacuzzi tub. Additional amenities in these North Myrtle Beach condominiums include high-speed Internet access, a washing machine, clothes dryer and at least one DVD player. Bring your laptop computer and peruse the hours of operation for all your favorite amusements. The laundry facilities in your North Myrtle Beach condo at Beach Club III are wonderful for families who play hard during their North Myrtle Beach vacation. For a quiet night in during your family’s North Myrtle Beach vacation you might want to watch a movie. With a DVD player in your comfortable North Myrtle Beach rental you can pop popcorn and then pop in a movie. But for all those evenings and North Myrtle Beach vacation days that you want to run around North Myrtle Beach and enjoy all there is to see and do, you are well positioned when you stay at Beach Club III. This centrally located North Myrtle Beach resort is near championship golf courses, live entertainment theatres, beach clubs with shag dancing and shopping! Seafood restaurants are on every corner and water sports are found on the beachfront, at marinas near the salt marsh and up and down the Intracoastal Waterway. Beach Club III is a North Myrtle Beach resort that is near the Cherry Grove Fishing Pier, close to kayak rentals that are a perfect way to see the nearby inlet and outlet malls with your favorite name brands at exceptional prices. There are more than 100 Myrtle Beach area golf courses and more than 1,500 restaurants found throughout the Myrtle Beach area. Amusements, attractions and dining options are minutes away from Beach Club III.